The global demand for energy will challenge energy supply directly impacting the productivity for future growth and prosperity of cities. Stability and efficiency across multi domain energy grids are crucial. Coupling technologies like Combined Heat and Power (CHP) allow these multi-utility grids to be considered and operated as Hybrid Energy Network increasing even more efficiency levels and reducing overall CO2 footprint. Although interactions are increasingly apparent, an optimal synergy between them has neither been comprehensively analysed nor implemented in practice. The OrPHEuS project elaborates a Hybrid Energy Network Control System for Smart Cities implementing the scientific concept of Cooperative Existance. 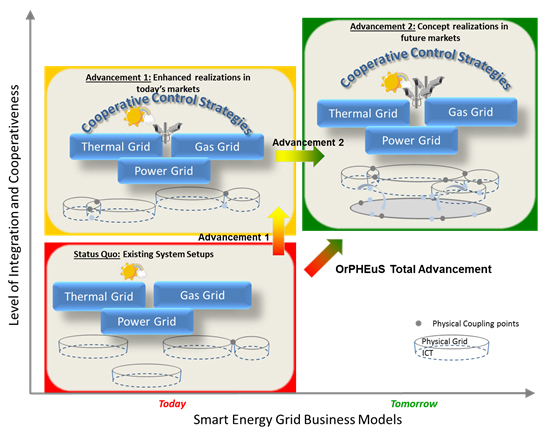 The project intends to define new cooperative local grid and inter-grid control strategies for the optimal interactions between multiple energy grids by enabling simultaneous optimization for individual response requirements, energy efficiencies and energy savings as well as coupled operational, economic and social impacts. Starting from existing system setups in two cities, enhanced operational scenarios are demonstrated for today’s market setup, as well as for future market visions. 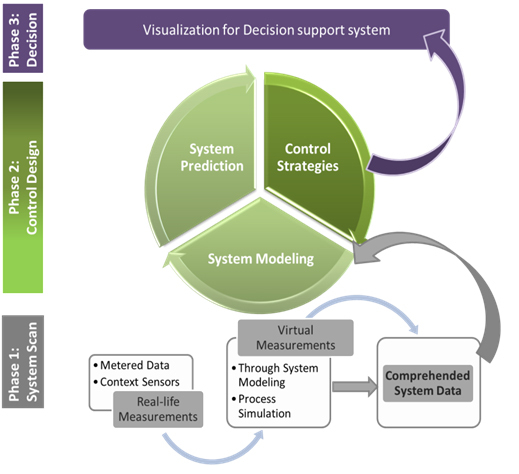 The project, in its second year of implementation, is moving from the "Scan Phase" to the "Control Design". During the “Scan Phase”, the demonstration sites have been investigated for control goals and available input parameters as given today. We started to analyse the status quo of technical, economical and social patterns of energy services in the distribution energy networks. This resulted in use cases tackling different interesting research questions in the context of hybrid energy systems for the two demonstration sites, Ulm in Germany and Skellefteå in Sweden. The selection of the use cases was based on the actual challenges in the OrPHEuS demonstration sites and each of these use cases focuses on a special problem or objective of a particular market participant.